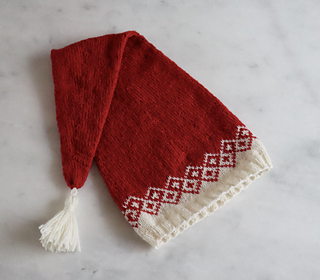 Bohéme Christmas Hat is inspired by the popular Bohéme sweaters. Of course, I had to design a Christmas Hat, because I love the Christmas season. How cute would it be to own a Sweater and a matching Christmas Hat? The pattern is inspired, like the sweaters, by an old traditional Faroese Fair Isle pattern, but altered to my liking. Circular needles or 5 double pointed needles no. 3 ( US 21⁄2 ) and 31⁄2 (US 4). Navia Duo, 2-Ply Snældan or other yarns with same sportsweight/gauge. One main colour (red in picture) and one contrast (white in picture).